Welcome to our Bendy, Giggly world. My name is Leia, I took over the ownership of Tatty Bumpkin St Albans just over a year ago now. I cover St Albans, Welwyn Garden City and Harpenden areas. I was introduced to the world of Tatty Bumpkin when I had my little girl 4 & a half years ago. I started taking her to classes when she was 5 weeks old, the classes helped us bond, made her stronger and gave me a little stretch too! As she grew she became adventurous, just like Tatty Bumpkin, and now her imagination never ceases to amaze me! I am excited to be able to bring Tatty Bumpkin back to the area and take your children on magical adventures in our classes. I have completed my teacher training in Tatty Bumpkin, Baby Bumpkin and SEN, am fully insured and hold an up to date DBS. If your school, nursery or playgroup is holding a special event please let me know and we will be able to organise a Tatty session or Tatty Bumpkin stall. We are also available for parties, weddings, festivals, fetes, open days and celebrations. Please do not hesitate to contact me by email. I loved it when we were pretending to be a volcano in yoga today. We also enjoyed being the sun that TAtty Bupkin saw in space! Thank you for doing yoga with us every week. I really like doing Bendy, Giggly, Clever & Strong each week, I've got more stretchy! I like meeting the cockerel and bee but the rabbit was even better. I also like the dinosaur! Children love Tatty Bumpkin and get excited when they know it's yoga day. Very relaxing and calming for the children and Leia is very good with them. She does similar things everytime she comes but changes it slightly so the children know what they are doing but it's not too repetitive - THEY JUST LOVE IT!! Thank you for teaching me yoga moves. I like the tree pose the best and downward dog. "Leia you are so personal with the staff and children and they absolutely love your classes!!" "The children really look forward to yoga and have so much fun in each class." "The children enjoy Leia's story time throughout the yoga session, allowing them to explore their imagination" "The babies are very relaxed during yoga and it calms the room for the rest of the day." 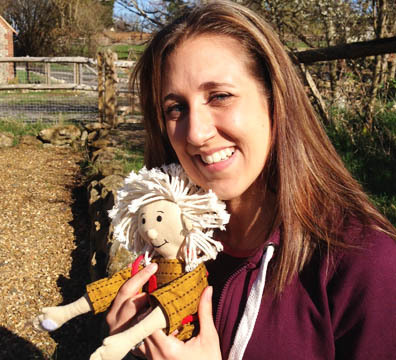 "Leia brings a magical feel to the nursery, she is so soft and caring to each and every child and our staff members." "Leia takes the time to understand each child and remember who they are and their different needs." I really enjoy yoga, especialy with you Leia as our teacher! I enjoyed playing crab football and the rainbow ging over us. I also like shouting cocka doodle doo and making Tatty Bumpkin toast for breakfast, it's like a volcano. I like our rhyme to the Gggle Tree. I remeber crocdile, spider, starfish, dolphin, and gloomy cloud!